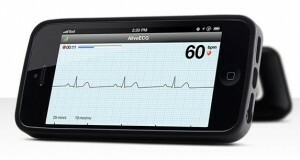 The company AliveCor has created a portable heart monitor for the iPhone. It is a single lead ECG that uses a simple 3-volt coin cell battery for power and sends all of its readings to your iPhone remotely. 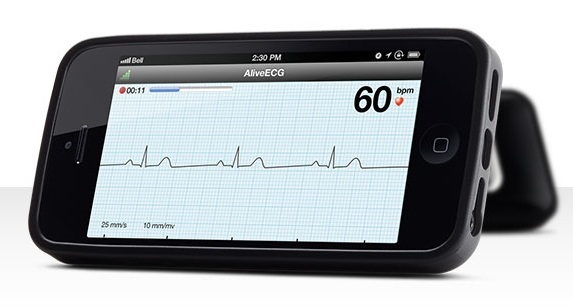 The app on your iPhone then records, displays, and stores the ECG readings in your phone. It can also transfer the readings to a secure server where specialists can review them remotely. The FDA has approved use of this device for physicians and patients with a prescription for it. It has been mentioned that it can and will possibly be used in local pharmacies and physician offices. It is said to be much more cost-effective than the traditional 12-lead EKG’s that are currently being used. The iECG AliveCor app and device is also extremely portable and flexible. One much discussed use for this new iECG is its ability to detect the arrhythmia atrial fibrillation. In fact, it is said that many physician offices are using the device as a screening tool done by the office’s ancillary staff before the patient is even seen by the physician- almost like another vital sign. This is because of the device’s ability to send the reading to a website that can automatically analyze and determine if the patient is having atrial fibrillation to a 97% accuracy per recent research. Atrial fibrillation causes the top chambers of the heart quiver or fibrillate. Besides decreasing the efficiency at which the heart is able to pump blood, it also causes turbulence of the blood inside the heart’s atria. The body sees this turbulence as almost like an injury and sends platelets there. This accumulation of platelets causes clots to form in the atria. These clots then get pumped through the heart and can get sent to the lung causing what’s called a pulmonary embolus or the brain causing a stroke. Patients with atrial fibrillation most times get put on some kind of anticoagulant or “blood thinner” like Coumadin/Warfarin or Plavix. Some symptoms of atrial fibrillation are dizziness or lightheadedness, fatigue, palpitations (the patient may state it feels like their heart is “fluttering”). However, atrial fibrillation may also cause no symptoms in the patient at all – in this case this rhythm can go undetected and untreated and lead to one of the life-threatening complications mentioned above. This is why using the new AliveCor iECG as a screening tool can be so useful.